We are proud to present a new title from Sagest! Order your copy from our online store. (Bookstores may contact Sagest for quantity orders or download the information sheet.) The book is also available at Vroman’s Bookstore in Pasadena. 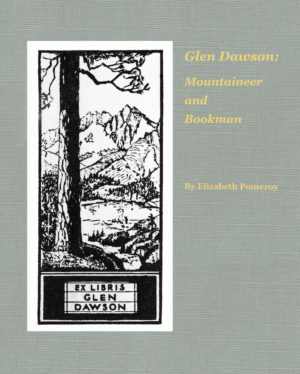 Glen Dawson was born into a world of books, libraries, and mountain climbing, only seven years after his father opened Ernest Dawson’s Antique Book Shop on South Broadway in Los Angeles in 1905. His father would be his early mentor and his destiny was set, a destiny now engagingly told by Elizabeth Pomeroy. 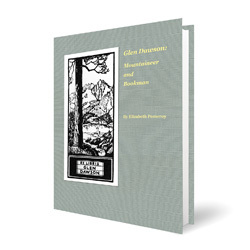 She invites you into his several worlds—and more—as she skillfully unpacks Glen’s remarkable life story, showing how his footprints measured the Sierra Nevada and other mountain peaks, as his presence measured the antiquarian book world of Los Angeles. 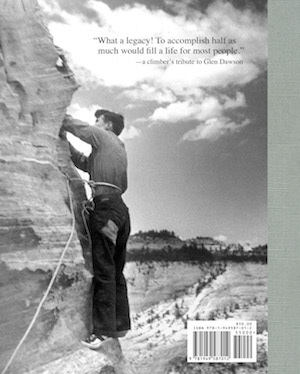 2-piece linen cloth cover with a front debossed tip-on reproduction of a Dawson bookplate, and back photo of Glen Dawson climbing in Utah’s Zion National Park. Both images feature soft touch lamination. End sheets feature the cover pattern from The Malibu (1958) and a map rendering from Sierra Nevada Big Trees (1985).